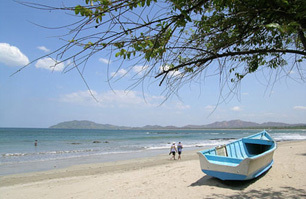 Tamarindo Beach is part of a bay formed by a cape, Cabo Velas (velas is Spanish for sails, or sailfish). Playa Grande lies to the north of Tamarindo Beach inside the bay. 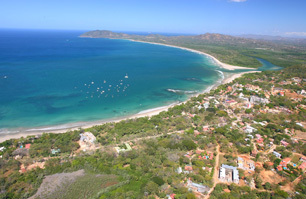 The two beaches are separated by a natural salt water estuary, Estero Tamarindo. South of Tamarindo Bay there is another beautiful estuary and beach, Playa Langosta Pristine white sand beaches, world class golf, sport fishing, horseback riding and nature trails are all within a short drive from Casa de Valencia. Endless Summer 2, the sequel to the famous surf movie was filmed here in part. 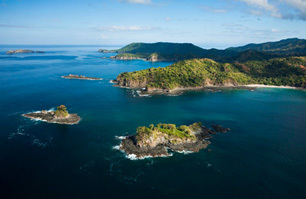 Both Playa Grande and Playa Langosta are protected nesting areas for the giant leatherback turtle, and are part of the Costa Rican national park system. These beaches are the major nesting areas worldwide for the turtles, which arrive from October to March to lay their eggs. Tours led by official guides are available to take visitors to see this incredible spectacle. Another very special tour is the jungle boat ride. Small groups are ferried on locally built skiffs deep into the mysterious mangrove forest, where a breathtaking diversity of birds, mammals, and reptiles can be seen. Tamarindo boasts an amazing selection of fine international and typical Costa Rican restaurants. Tamarindo has seafood, sushi, Italian, Mexican, burgers, a Belgian bakery, as well as restaurants catering to health-conscious and vegetarian patrons. You will never tire of sampling the wonderful variations of uniquely prepared specialities featuring the abundant supply of fresh local seafood, fruits and vegetables. Food and drinks are very reasonable in cost. Tamarindo also has grocery stores, fresh produce and fruit juice stands, an ice factory, a variety of souvenir and clothing shops, several art galleries, a medical clinic, a full service bank with ATM machine, real estate offices, hardware stores, laudromats, internet cafes, several facial/massage salons and a yoga studio. Tamarindo's climate has two seasons, dry and rainy. The dry season, from November through April, is dry, hot and sunny. The humidity is very low and comfortable. The rainy season or "green" season begins in late April or early May and continues through October. A typical day is sunny or partly cloudy until late afternoon or evening, when showers build inland and move offshore, often producing spectacular sunsets. Everything is green and lush during this time of year. Although there are no hurricanes here, a hurricane or tropical depression in the Atlantic or Caribbean often means rain for Tamarindo. Temperatures in Tamarindo range between 80 and 100 degrees year round.